1600hrs David has received word from the College stating the bird is progressing well and is eating "waxworms" without problem, although its weight is on 36grms where it should be 44 grms, so they are keeping it there again for another night before hopefully handing over tomorrow morning. 1200hrs David rang the College this morning and they said the bird had eaten 4 mealworms and taking in water OK. They said they had one further test to check in regard to a flight test and that the vet would be doing the rounds early afternoon. Then all being well the bird should be released for us to hopefully set free close to the area of finding. Can't Wait! 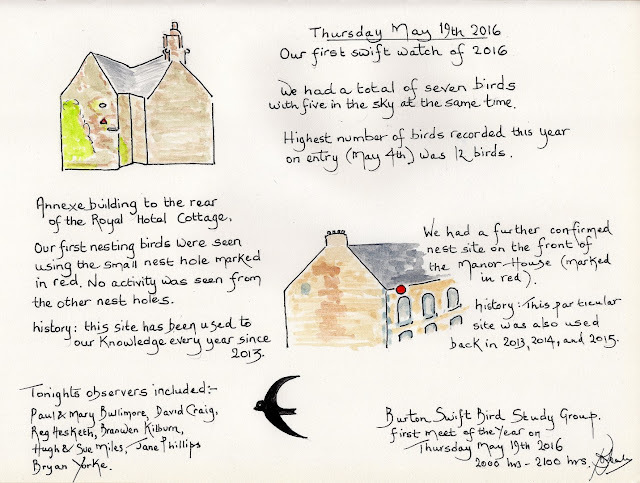 "POOR SWIFT" Monday 23rd May 2016 - Care of David Craig and Kendal College Wildlife Dept. 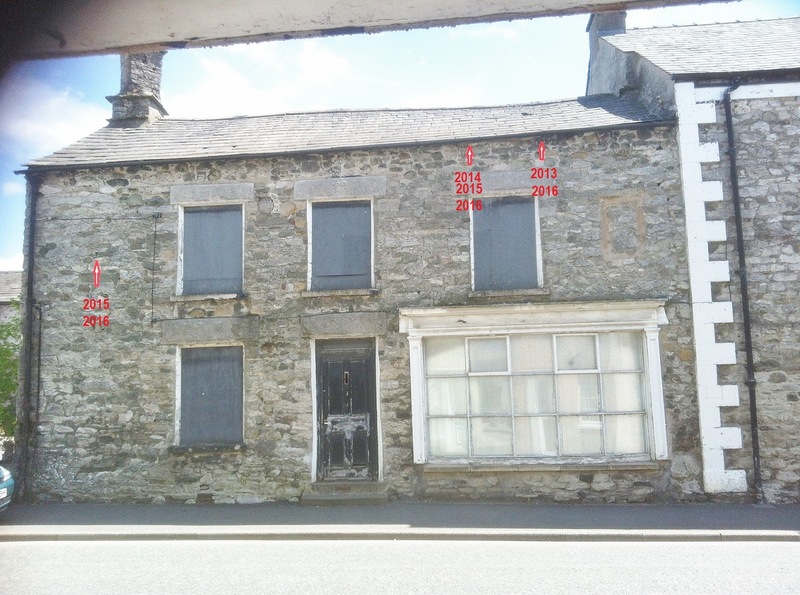 New nest sites "Sunday 22nd May 2016 - Royal Hotel Cottage - Front Elevation. 1000hrs - To everyone's surprise the poorly Swift had shown improvement overnight, for one it did not look wet and bedraggled, but beautiful dry feathered and gripping and moving about better with ever blinking eye which is far better than it was yesterday. David has constantly been in attention at regular intervals. This morning he decided to take it to the vet in Kendal who checked it over and could not find any problems of injury but gave David some paste which he said would help it and would have far more protein than insects if it could be administered. David has managed to feed it a little which it has accepted and is hoping to give it little water by shringe later. Hopefully if it progresses over the next 24 hours we do intend to try and release it back to the area where it was found. 1200hrs - Whilst showing my wife the nesting sites on the rear of the Royal, with much sadness I found a Swift on the floor with spread out wings. At first it looked as though it was already very wet and dead but I soon realised it was not dead but injured. I did try to release from a higher elevation but without success the bird sort of glided back to the ground. Remembering last year and David's fine dedication! I took the bird across the road to David Craigs where now the bird will be regular checked and left with peace and quiet and away from prowling cats etc within the safe confines of his garden summer house. The bird was identified that in all probability to be a adult and perhaps one of the birds nesting in the rear of the Royal Hotel. This concluded our observations for the evening and we have planned to meet up again next Thursday at 2000hrs when all persons interested in watching the Swifts will be very welcome.